Charming rooms with private big porch. 1 bedroom with a queen bed, open concept bedroom has a double bed. The sunroom has two twin size beds. The main room has a double futon sofa. Included a full kitchen and 1 bathroom with shower. The main room and the sunroom provide lots of light, while keeping you still cool during summer nights. The rest of the suite offers lots of shade as well. Books about New Mexico, maps, etc are available as are binoculars for bird watching. Books to read, family games, chess and a deck of cards also available for your enjoyment. Although we do not offer TV there is free unlimited WiFi per request. We will provide you with the portable Verizon Hot Spot device. You are only a beautiful 20 min drive to Downtown Santa Fe and its major attractions and 15 min drive to the lovely village of Pecos, entryway to Pecos High Country with many hiking trails and Pecos National Monument. Pecos River offers excellent fly fishing and nearby Glorieta and Rowe Mesas provide great terrain for mountain biking. The guest suite is separated from the main house by two large barn doors. There is a separate entry and lots of parking adjacent to our parking spaces. We encourage you to enjoy our koi ponds and surrounding gardens, watch humming birds all day long and Mexican bats sweeping the ponds in the evenings. We live on the property and, when at home, we will be more than happy to answer any questions. We will absolutely respect your privacy. Both Pete and I are avid hikers and backpackers and skiers and snowshoers in the winter. We have a broad knowledge about Santa Fe and surrounding areas and we will gladly share it with you if you wish. Having your own vehicle is the best option since there is no public transportation from Glorieta to Santa Fe. During winter, we recommend that you have an all wheel or 4 wheel drive vehicle. There are no restaurants and no grocery store in Glorieta. The best place to eat out or buy groceries would be Santa Fe, just 20 min drive. But we will always have coffee and cream and assortment of teas for you in the kitchen. This is a quiet, rural area and on occasion wildlife can be seen or heard. The last thing to be mentioned is that the listed basic price is for up to 2 guests spending the night. There is a small additional fee of $20 per person per night. Note while booking. Hello, I met my husband Pete while traveling, on a beach in Mexico 27 years ago. Today we still travel together and love to share our experience with others. Pete is a "native" New Mexican and I am from Poland. We both still speak pretty good Spanish, Pete can still get things done in German. I love taking care of the house and the garden. We are both avid hikers and skiers and love to be outdoors, rain or shine. I practice yoga by the ponds and you are more than welcome to join me. 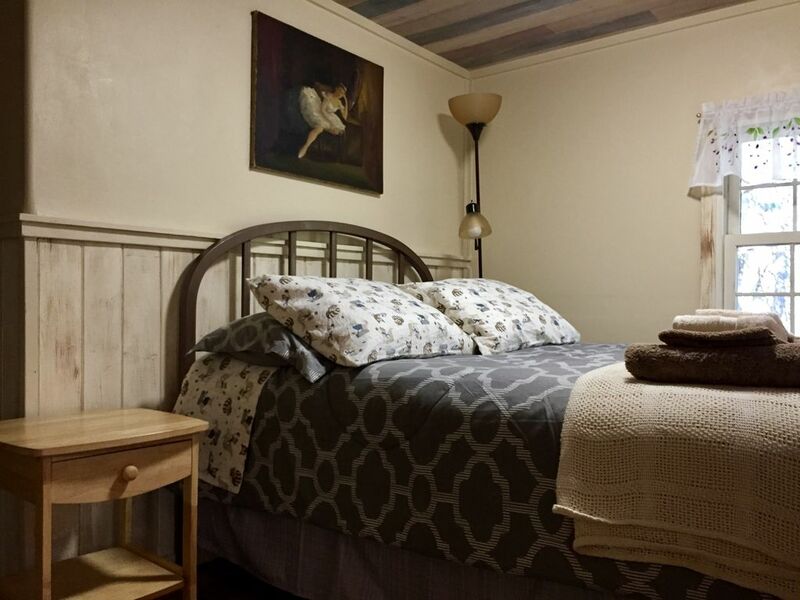 Recently Pete has remodeled part of our spacious home and converted it into a charming guest suite. If you love quiet, Ponderosa pines and nature, you will love our simple and relaxing place. Both my husband Pete and I love the peace of rural life, but we still wanted to have an easy access to town. Glorieta is so beautiful and easy. it takes me just 20 min to get to work Downtown Santa Fe and just 15 minutes to get to one of my favorite places Pecos National Historical Park. Our property is a beautiful 20 min drive to Downtown Santa Fe and its major attractions and 15 min drive to the lovely village of Pecos, entryway to Pecos High Country with many hiking trails and Pecos National Monument. Pecos River offers excellent fly fishing and nearby Glorieta and Rowe Mesas provide great terrain for mountain biking. I still work part-time in Santa Fe and Pete works in Pecos. We are avid hikers and snowshoers in the winter. Glorieta Village is perfect for it. Rustic bathroom has nice shower, toilet and sink. Hair dryer, shampoo and soap provided. Towels as well. You have your own big private porch. We also encourage you to enjoy our koi ponds on the upper deck and small courtyard shared with the main house. Our place is located just one hour and 15 min for Santa Fe Ski Area. Also there is plenty of great terrain close by for snow shoeing and cross country skiing. We loved the quiet solitude. The kids loved the birds and the koi ponds. We would definitely stay here again. We enjoyed our stay under Glorieta Mesa so close to Pecos National Historical Park's Encampment event. The grill is very nice! 15 min from Santa Fe and 10 min from Pecos. Very welcoming couple and a well supplied kitchen and large convenient spaces. It was a great place to stay for a Santa Fe getaway. My partner and I really enjoyed it and loved staying there. Ewa was so kind and helpful, and we hope to stay there again. It was a pleasure to host you guys! My girlfriend and I stayed at this house and thoroughly enjoyed it! Ewa and Pete were fantastic hosts. 20 min to Santa Fe BUT the stars are phenomenal and the seclusion was quite nice! Thank you Kent for your kind words. You, Emily and Jax are always welcome in Glorieta. Come back soon! 20 min drive to Santa Fe and 15 min drive to Pecos and Pesoc Historical Park, one of my favorite places.